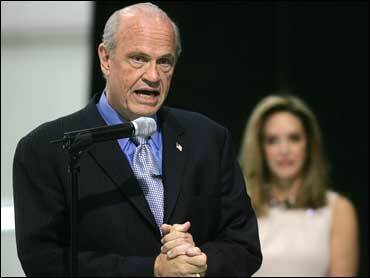 Republican presidential candidate Fred Thompson is returning to Florida for a four-day trip and he wants to make something clear: He doesn't want oil drilling in the Everglades. "It's a national treasure and it's not to be messed with and I can't imagine anybody doing so," Thompson said during a phone interview Thursday. After a meeting with Gov. Charlie Crist last month, he was asked about whether he would support drilling in the Everglades. He responded, in part, "I'm not going to start out by taking this, that or the other off the table." That remark prompted Crist to later say he "wasn't overjoyed" with what Thompson had to say about Florida issues. Thompson said Thursday, though, that it's not something he would support. "I didn't think there was a serious proposal out there with regard to the Everglades and I probably treated it as such, but it's certainly not something that I would be for and it's certainly something the state, as far as I'm concerned, would have a major say in." It was recently a serious issue in Florida. The Collier family planned a major expansion to their oil drilling operation in Big Cypress National Preserve on the western edge of the Everglades until President Bush agreed in 2002 to spend $120 million on oil and gas rights. That stopped the family from building new roads, conducting underground blasts and drilling nearly 15,000 test holes over a 41-square-mile grid. Thompson was a Tennessee senator at the time. Thompson, who also starred in NBC's "Law & Order," and other candidates will address state Republican Party activists Saturday and then participate in a debate sponsored by the state party and Fox News on Sunday. Thompson will then make a two-day tour through the state. Since announcing his candidacy last month, he has put a larger emphasis on Florida than New Hampshire. He did a three-day bus tour across Florida a week after his announcement, then returned the following week to meet with Crist and raise money. He has made one trip to New Hampshire since his announcement and canceled a trip there last weekend. Candidates usually make the New England state a frequent stop because of its first-in-the-nation primary. "I've spent some time in Florida, I'm going to spend some more time, but I'm going to do the same thing in New Hampshire, it's just a matter of timing," he said. Florida moved up it's primary to Jan. 29, a week before at least 19 other states hold Republican primaries and caucuses. Thompson is polling second in Florida behind former New York Mayor Rudy Giuliani, while he's fourth in New Hampshire. CBSNews.com's Brian Montopoli examines the chase for GOP votes in Florida. "Florida's extremely important. I consider Florida being kind of a part of my neck of the woods," he said. "I'm sure that the time I have spent, and I'm going to be spending (there) will be indicative of that." Crist on Thursday said he hopes Thompson warms up to his federal priorities, including the creation of a national insurance backup fund and environmental issues. "The issues that matter to me and the people of our state are the national catastrophic fund, that we get that going; that we protect Florida's precious Everglades - our environment is very important; and that we not have somebody in the White House who thinks we need to drill off the coast of our state," Crist said. "I would urge him to care a great deal about the Sunshine State." Thompson, who said previously he is open to the idea of drilling in the eastern Gulf of Mexico, said he would take the state's concerns into consideration. "We're drilling off the shore now in various places, but there are moratoriums in place and I have no problem with that. They've been for good reasons. You look at the area and you make a decision based upon environmental concerns and things like that. States should have and do have a very important say," he said.